1. a saw for removing a disk of bone, chiefly from the skull. 2. an instrument for removing a circular area of cornea. 3. to remove with this instrument. 1. A cylindric or crown saw used for the removal of a disc of bone, especially from the skull, or of other firm tissue as that of the cornea. 2. To remove a disc of bone or other tissue by means of a trephine. 1. 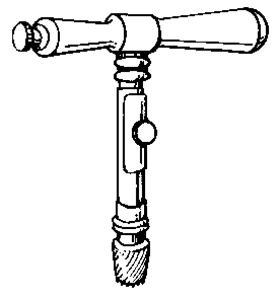 A cylindric or crown saw used for the removal of a disc of bone, especially from the skull, or of other firm tissue. They spied a grave with a bit of frozen earth nearby in exactly the shape of Apollinaire's head, with grass for hair around the scar where he had been trepanned. Yet civilians knew that they were often trepanned into the service, subjected to atrocious conditions that were quite similar to - or were simply a military form of slavery, and generally abused, while the bones of most would remain forgotten in some remote land, or under the ocean's depths. We brought aboard the aircraft trepanned monkeys and cancerous ducks. Other applications include thin-section bores, trepanned bores, shaft diameters, and tapered bores.